Trade.com was founded in 2009, and it has quickly grown to become a leader in the industry, combining state-of-the-art trading platforms with a large asset index comprising a full range of stocks, commodities, currencies, and indices, as well as providing trading education and superb customer service. Designed to cater to traders of all levels, if you’re looking for a CFD broker, Trade.com should definitely be on your radar. Trade.com is operated by LeadCapital Markets Ltd, and is regulated by CySEC under license number 227/14. The regulatory body ensures that trading and operations are done in a transparent and secure manner, and should give all potential customers peace of mind. Whether you are using the MT4 platform, WebTrader or trading on your mobile, the charts and tools available to you are robust, advanced, and simultaneously user-friendly. Plus, the index of over 200 trading instruments will be sure to have the assets you are looking to invest/trade in, whether it’s a blue-ship stock or a smaller, lesser-known instrument. Trade.com looks to cater to beginners and more advanced traders alike and has a full library of educational resources comprising videos, eBooks, and webinars. They also provide a $100,000 demo account for you to practice on until you are ready to move on to a funded account. 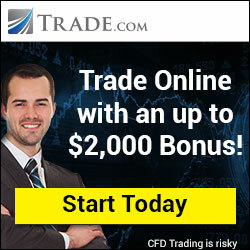 Every account at Trade.com gets a dedicated account manager and traders can also receive personal 1-on-1 training. Furthermore, in terms of customer support, Trade.com customer service reps are on hand ready and waiting to help 24/5 via phone, email, and live chat.